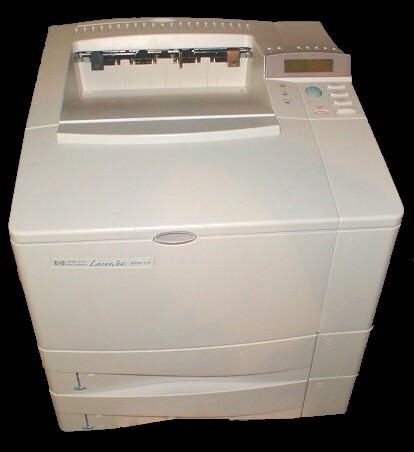 Fully refurbished HP Laserjet 4000, please also check below for the accessories we offer for the model 4000. If you have any questions feel free to Email, FAX or Call us. We also offer REPAIR service on this model of printer, if you wish to have your printer Repaired please Go Here. This is HP's new generation of printers for the high end office, comes with 100MHz processor built in. Recommended for printing any text documents, small to large spread sheets, small to large forms, Multi-page/full page graphics, small to large networks. Designed to handle high speed printing with it's 100MHZ Risc Processor. Matching the performance of many of the bigger printers out there while keeping it weight and size down for the smaller office. HP LaserJet 4000 series printers bring significant technology improvements to workgroup laser printing. From paper handling to print quality, HP has completely redesigned the best-selling HP LaserJet 5 printer based on customer needs. 600-sheet standard capacity reduces paper restocking. Additional input sources (one 100-sheet tray plus either one 500-sheet tray or two 250- sheet trays) let you print on multiple paper sizes without swapping trays. Straight-through paper path lets you use a wider variety of paper sizes and weights, and eliminates curling of heavier media and envelopes.